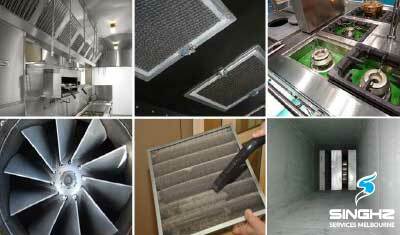 We are kitchen exhaust cleaning and canopy cleaning specialists in Melbourne. Singhz also offer best end of lease cleaning, lawn mowing services and after builders cleaning services in Melbourne. We strive to provide quality service. Singhz provide first rate workmanship to ensure you are completely satisfied. If you’re not satisfied with our work, we’ll re do it again. We are experienced, friendly, background checked and insured. Book online in 1 Minute and schedule your service. Looking for bond cleaners in Melbourne, we will beat any written quote. Kitchen Exhaust Cleaning is important to prevent unexpected fire disasters due to ventilation ducts overfilling. We provide maintenance program that ensures your kitchen exhaust & ventilation system is in top condition. Kitchen Exhaust Cleaning Services In Melbourne. We are specialise in a range of quality kitchen exhaust cleaning in Melbourne. We also offer restaurant and kitchen equipment cleaning services in Melbourne. We provide affordable daily, weekly and monthly occasional cleaning services to all kind of businesses. If you are looking for kitchen exhaust cleaning to pass a restaurant health inspection or a restaurant fire inspection? Our special restaurant cleaning will get you a clean report from the health or fire inspector. Singhz Services Melbourne take the time to listen and understand our customer needs and requirements. Have the garden you have always wanted. 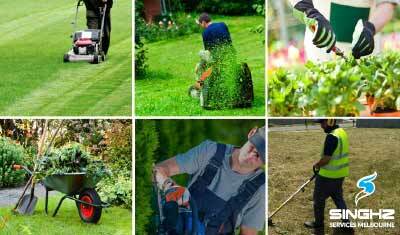 Are you looking for lawn mowing services for your house or business. Singhz Lawn Mowing services can provide the right solution for you. Most lawn experts agree that a majority of our lawn care problems are a result of not mowing at the proper height. Our professional staff are dedicated to provide you professional, reliable and affordable gardening solutions. Singhz Lawn Mowing Services take an immense pride in our reputation for delivering excellent and affordable lawn care services in Melbourne. 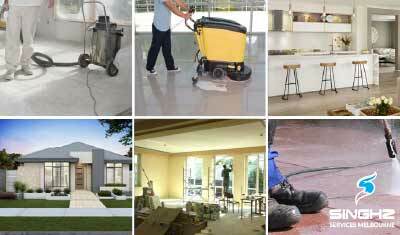 Singhz Builders Cleaning also offer residential and commercial construction cleaning in Melbourne. Our team can tackle any builder clean regardless of how large or small your cleaning requirements. We specialise in efficient builders cleaning for newly built luxury homes in Melbourne. We will schedule our cleaning to immediately follow any building work carried out at your property. Are you moving out of your property and looking for professional bond cleaners in Melbourne? We have full-fledged Bond cleaners team that ensures the bond cleaning service quality exceeds industry standard and the customers get 100% satisfaction for bond cleaning. Our bond cleaning service covers both the house end of lease clean and carpet steam cleaning. Discounts apply to those booking both the house cleaning and carpet cleaning service. Our bond cleaning for residential houses in Melbourne can be comprehensive where we clean the whole interior of the house plus exterior cobwebs, footpaths, patios and balconies. Singhz Services offer over the phone or via online booking fixed priced quotations for bond cleaning, move out cleaning, vacate cleaning and of course, end of tenancy cleaning in Melbourne.